Design & Designer 045 – Non-Format, official blurb: Norwegian Kjell Ekhorn trained as a graphic designer at Central Saint Martins, London, from 1993 to 1996. Jon Forss, who's English, studied at Leicester Polytechnic from 1986 to 1989. 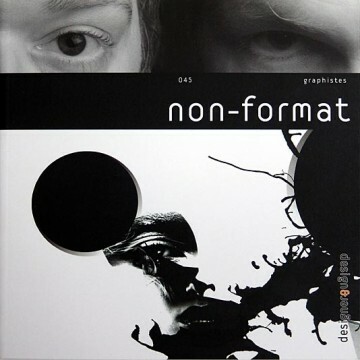 After experiences in creative disciplines ranging from advertising to art direction, they founded Non-Format in 2001. For their clients in the music industry, fashion and advertising, Non-Format create work that defies categorisation – conceiving entire graphic worlds that display ever-greater imagination and inventiveness. This dazzlingly creative duo now work from a studio in London. Their meticulous and pragmatic designs convey a singular poetry and intelligence. Respectful of graphic-design tradition yet averse to convention, they craft a graphic language that is rich, complex, direct and precise. In their role as art directors, they helped revitalise the image of music monthly The Wire from 2001 to 2005.